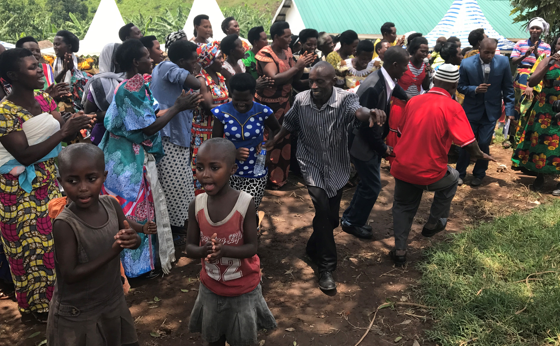 The Mubende community celebrates during the case closure ceremony at Kampendu, Uganda, September 2017 (CAO). CAO concluded its monitoring of outcomes reached through mediation between the New Forests Company (NFC) and a local community displaced from government-owned forestry reserves. NFC—an African forestry company supported by Agri-Vie Agribusiness Fund, an IFC client—operates three pine and eucalyptus plantations in the Mubende, Kiboga, and Bugiri districts. A complaint was filed to CAO in December 2011 by the Mubende community supported by Oxfam and Uganda Land Alliance. Following mediation, an agreement was reached in 2013 establishing a joint program through which the company committed to provide significant funds to support community development projects. The community established the Mubende Bukakikama Cooperative Society to receive this support. They have since acquired almost 600 acres of land for small-scale farming and resettlement of several hundred member households. Together, the community and company have implemented projects including a health clinic, water boreholes and handpumps, a small grain mill and store, and construction of a school house. NFC also provided fruit saplings, beehives, and tilapia fingerlings for a fish-farming project, among other income generating initiatives. CAO monitored implementation of the agreement for four years before closing the case in February 2018. CAO continues to monitor outcomes from a second mediation between NFC and the Kiboga community. Farmer and Bidco representatives discuss ways to work together to create economic initiatives in Kalangala, Uganda, December 2017 (CAO). 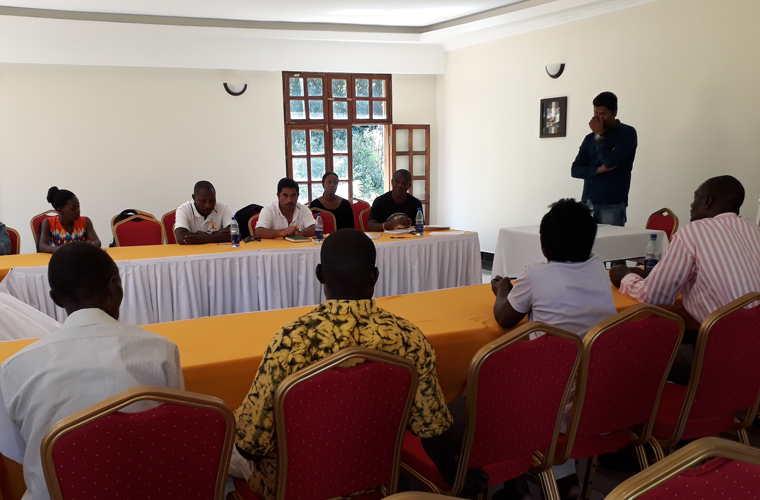 Elsewhere in Uganda, CAO concluded a mediation process between 38 smallholder farmers and Bidco Africa, an IFC client in the manufacturing sector. A complaint filed in January 2017 raised compensation issues and multiple claims on land acquired by Bidco Africa’s subsidiary, Oil Palm Uganda Ltd (OPUL), for palm oil plantations. The mediation led to compensation for the farmers and secure land tenure for those complainants who continue to occupy the plantations. It also resulted in the company working with the complainants to assist them in setting up small projects to generate income. CAO documented outcomes from the process in a conclusion report in February 2018. CAO also concluded monitoring a final agreement regarding land expropriated for the Bujagali hydropower project in 2000 for which the landowner had not received compensation. A settlement agreement was signed in June 2017 and approved by the Ugandan electricity utility (UETCL) in November 2017. CAO monitored implementation of the agreement until UETCL issued full payment to the complainant in April 2018. CAO has ongoing compliance casework related to the Bujagali project, which is supported by IFC and MIGA.